THE CURSING BY JESUS of the barren fig tree, with its subsequent destruction, too long has been misunderstood. Those who see in Jesus only the good that can do no harm cannot see how he could destroy anything, even a tree. Some have believed Jesus made this demonstration to show that since divine law is impersonal, such power can be used in the wrong way; but it is man’s responsibility to use it rightly, or suffer the consequences. Although this is true, it is not the lesson Jesus taught by this act. Like all of his demonstrations recorded in the Gospels, it was also symbolic. Careful study of the incident shows that Jesus meant to teach us a lesson of utmost importance regarding our consciousness. As with other acts and parables, location in the Gospels and relation to other works of Jesus are significant. This demonstration is found in Matthew 21:17–22 and in Mark 11:12–14, 20–26. Matthew, as a disciple of Jesus, represents the faculty of will instructed by the Christ. John Mark, referred to by Peter as his son — whether literally or spiritually is not relative to the designation, in its inner meaning — would represent a thought (son or offspring) of the faculty of faith (Peter). We shall see how this might explain the difference in the two accounts as to the time involved in the withering of the tree after the curse. In each account this act is placed in immediate proximity to the driving out of the merchants and money changers from the temple by Jesus. This act has been interpreted properly as the casting out of the errors of wrong use of our substance and faculties. Thus, the destruction of the fig tree — discussed at the same time as, and actually being interrupted by, the temple scene in Mark — teaches a similar lesson. First let us consider the time and the place of the incident, and the symbols used in the parable; for it was a parable acted out for us. 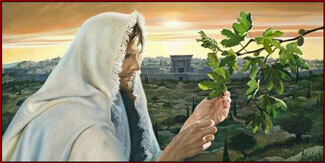 Jesus encountered the fig tree while returning from Bethany to Jerusalem. The Metaphysical Bible Dictionary (by Charles Fillmore of Unity School of Christianity) gives the meaning of Bethany as: house of figs; house of afflictions; house of distress; house of depression. Jerusalem means: habitation of peace; dwelling place of peace; possession of peace; foundation of peace; constitution of harmony; vision of peace; abode of prosperity. Thus, returning from Bethany clearly means turning back from thoughts (city) representing affliction, distress and depression; or negative thoughts, in general. Going back to Jerusalem means returning to the abiding consciousness of peace, harmony and prosperity. But your fig tree must be destroyed forever, lest once more you find yourself in Bethany and have to set out for Jerusalem. The Metaphysical Bible Dictionary tells us that a characteristic of the fig tree is the moaning, wailing, sighing sound of the wind through its foliage. The fig itself exudes drops of gum that resemble tears. Thus, the fig tree and its fruit would ideally represent the source (tree) of negative thoughts producing its fruit of misery (individual figs representing assorted miseries). Jesus showed that the symbolic fig tree could not bring forth its fruit of misery if one did not give them recognition as realities; that is, if he knows they have no reality in truth. Therefore, when man not only does not partake of negative thoughts but goes further and destroys the source of such thoughts, forbidding it ever again to bear fruit, he may leave the state of afflictions, distress and depression and forever dwell in harmony, peace and prosperity. But he must make certain that the tree or source is destroyed forever; the roots must be withered. In the account by Matthew, Jesus said, “Let no fruit grow on thee henceforward for ever” (King James Version), or “Let no fruit come from you any more to eternity” (New World Translation of Christian Greek Scriptures). By this he indicated that man, by the power of his word (proper realization of truth), must nevermore eat of that tree, must never again partake of such thoughts. The instant withering of the tree indicates that one must not put off destroying the source of negative thoughts, or must not attempt to do it too slowly. It can and should be done immediately and completely. Then he told his disciples that if they had sufficient faith and entertained no doubt, they not only could eliminate thoughts symbolized by a fig tree but could cause the entire mountain of error to be lifted up and cast into the sea (Divine Mind). The sea (truth) would dissolve the mountain (error). The account states that Jesus went to the fig tree because he was hungry. The meaning is similar to his being hungry after his temptation in the wilderness. Here the original Greek, according to the Emphatic Diaglott, says that Jesus was returning to the city “early”; it does not say “in the morning.” Thus, being hungry early after leaving Bethany for Jerusalem would mean that when one has left the habitation of despair to return to dwelling in peace, he may feel hungry, or be empty of thoughts. This emptiness may be in one of two ways: whether because he has cast off the former thoughts (error) on which he had been feeding, and was hungry for thoughts of some kind; or that he was now eager, in his newly found state of peace in truth, to make use of his new lease on life. In either case it would be important that his hunger henceforth be not relieved by the former error thoughts (figs). Therefore, lest he eat of this tree, even unknowingly, the source must be declared incapable of producing any more manifestations in his life. In the account by John Mark, the curse is given as “Let no one eat of you to the Age” (ED), or “May no one eat fruit from you any more forever” (NWT). The word translated here as “age” or “forever” is the Greek word aionian. It is a word that has no equivalent in English, and which has been translated variously in the New Testament as “forever,” “eternal,” and “end of the world.” Its meaning is: an indefinite period of time, past, present or future. This is clearly emphatic advice that one should never again, throughout his eternal life, indulge in thoughts of despair and misery. “And his disciples heard him” (ED). Since his disciples represent man’s twelve spiritual faculties, this sentence indicates that the advice is to be impressed on man’s subconscious as well as conscious aspects of mind so no negative thoughts can enter his mind, either over the walls or through the gate. In this version the fig tree did not wither instantly. 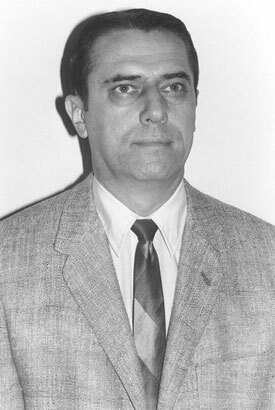 This account represents elimination by faith (Mark, son of Peter), by belief that it will be so, but without necessarily implying the degree of faith employed. That is, the faith of one with a higher working knowledge of truth will realize elimination of the negative fig tree sooner than one with a less highly developed consciousness. The instantaneous demonstration in Matthew’s account indicates that the will trained in and by truth (Matthew the disciple taught by Jesus the Christ) can combine cause and effect immediately, merely by decreeing and realizing. This is the meaning of verses 23 and 24, especially 24: “This is why I tell you, all the things you pray and ask for, have faith that you have practically received, and you will have them” (NWT). However, Mark was not one of the disciples taught by Jesus, but the son of Peter, representing faith. Thus Mark might well represent one who would not realize answers to prayers as soon, until he had unfolded more fully in consciousness. Note that it was Peter, representing faith, who called the attention of Jesus to the withering of the tree. Furthermore, the tree had withered from the roots up, meaning that negative thoughts can be destroyed not just individually, one at a time, but all at once and forever, by destroying the very source, the roots of the tree. This also indicates the higher aspect of cause and effect: spiritual cause produces material effect. Finally, note the kind of faith Jesus specifies here. Improper translation has Jesus telling his disciples, “Have faith in God.” The Emphatic Diaglott and the King James marginal note give it the proper translation, “Have the faith of God.” It makes a big difference in consciousness whether you realize that God has given man — His son, created in His image and likeness — the power of speaking the word, or you think you must merely believe in and have faith in God, taking no responsibility yourself. One recognizes at-onement with God, while the other does not. One is the son, the other a servant or a stranger. So, heed the advice of the Master. Recognize your “fig tree” and destroy it forever, if you would stop dwelling in despair and return to your spiritual home of peace. Only you can do it, by rising in consciousness to the plane where you, like Jesus, can decree a thing and know, with the faith of God, that it must be established unto you. El Morya/Mark, cofounder of Mark-Age, wrote this metaphysical interpretation in 1955, six years before Nada-Yolanda channeled a similar explanation (see below). “When you are in a state of consciousness that does not bear fruit for you, that is not productive or creative, cast it out from the garden of your being. For you are the gardeners, and your bodies and minds are the gardens of your soul. Do not entertain or clutter up your being with that which is unproductive to you in your growth and evolution. . . . Photos: (1) Jesus Curses the Fig Tree, artist unknown. (2) El Morya/Mark, 1966, Mark-Age Archives. 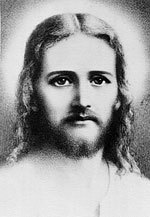 (3) Sananda/Jesus the Christ, Mark-Age Archives. Wonderful, such an important message, so timely. Thank you, brother, in these last days … and with the illusions and media disinformation everywhere. We need to focus on building our own sacred, higher merkabah of peace, health, right human relations and abundance. And then from that space command, the wind if need be. Wondrous, amazing, fantastic! Just what I needed to hear and become to start this blessed year, shutting out all negativity of all kinds. I am doubly happy that we are able to receive all this “Amazing Food” and be kept in our usual diet of: Peace, Love, Cooperation and Coordination; loving God and one another. Thank you, Phillel, for your gracious and hard work; and at the same time for the “hands on” of all aspects and facets of the I Am Nation. We are with you always, as we follow through, in deep appreciation and thanksgiving. Holding Dr. Robert and your dear self in the “Light of God that never fails.” Now and forevermore!